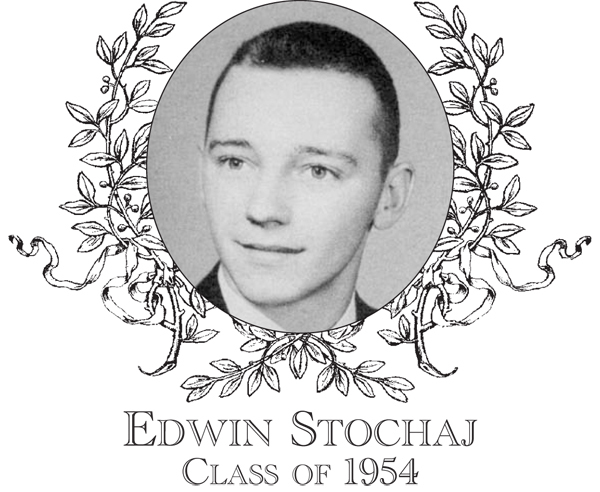 Edwin Stochaj, Class of 1954, was a three-letter athlete participating in football, basketball and baseball. In his senior year, he had the distinction of serving as co-captain in all three of the sports. The three captaincies were a direct result of his teammates recognizing his leadership skills, dedication and hustle on the gridiron, court and diamond. In basketball, Edwin was a guard known for his tenacious defense, and was routinely assigned the opponent�s top scoring threat. Standing at six feet tall, he also made his presence known on the boards, which was unusual for someone playing guard. His tough football attitude and hustle carried over to the basketball court from the gridiron. On offense, he was a solid passer and averaged 12 points per game. On the diamond, Edwin played two positions, left field and catcher, for the legendary Bartlett coach, Ziggy Strezlecki. Edwin had a strong arm, which he utilized in both positions. Runners attempting to steal second were gunned down and throws in from left prevented runners from advancing. In left field, he had both a good glove and an excellent range. In both his junior and senior years, he was a solid three hundred hitter. After graduation, Edwin attended Wilbraham & Monson Academy as a postgraduate student. At the Academy, he excelled in basketball and was named both MVP and to the All-Tournament team in a junior college tournament held in the Springfield area. After graduating from prep school, he went on to attend Springfield College prior to beginning his professional career in the insurance industry with Metropolitan Life and Travelers. In 1975, Edwin and his wife Ann established the E.J. Stochaj Insurance Agency, Inc. in Webster, and later moved the agency to Dudley. Edwin passed away in 2005 due to a heart ailment and he is survived by his wife Ann and four children, Lynn, Jim, Mary and Kate, and nine grandchildren.